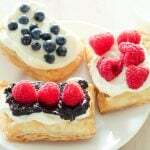 Easy Berry and Cream Cheese Pastries - for breakfast, brunch or dessert! These Easy Berry and Cream Cheese Pastries take buttery puff pastry, top it with a rich cream cheese filling and juicy fresh blueberries or raspberries (and chocolate, if you want!). Line a cookie sheet with parchment paper and unroll one roll of puff pastry onto it. Try to smooth it out. Use a sharp knife to cut it into 9 squares (or whatever number you want) and then score a border on each square (don't cut all the way through). Bake in preheated oven for about 15 minutes - until pastry is light golden brown. While the pastry is baking, use a hand mixer to cream softened cream cheese. Add icing sugar and vanilla. Your squares should be puffy. Let them cool on a wire rack. Use a teaspoon to press down the centre section (inside the border you made with the knife). Once they are completely cool divide the cream cheese mixture between them and top with berries or your choice. *Also, as I was making these I thought "chocolate?!?!?!" so I microwaved a few tablespoons of dark chocolate chips with a bit of cream and spread it on the cream cheese under the berries. SO GOOD.